Becca Ward knows that magic is real... Two years ago not only had she and her best friend Alex found a real-life Sleeping Beauty in the middle of Los Angeles, they also discovered that they were powerful in their own right. They’ve managed to keep both their fae powers and their friend Lilia’s identity as a medieval princess a secret and live a normal life. Now their normalcy is threatened by the return of their former advisor at the Gem and Mineral Museum—and Becca’s least favorite person, Nicholas Hunt. ...and she’s about to find out that more than one fairy tale is true. Nicholas has been obsessed with proving Lilia’s identity and the existence of magic. While working on an archeology dig he discovered an ancient fae artifact—a mirror that is imbued with a powerful protection spell that twists his obsession, and his body, until he is more beast than man. In order to protect her friends, Becca is forced to help him, and she is surprised to find that in spite of his outward appearance, Nicholas is no longer the beast she remembers. Will she let herself be the beauty that breaks the curse, or will she let her prejudice against him stop her from discovering true love? 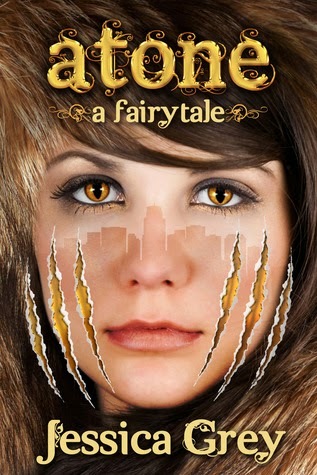 Atone picked up where Awake ended, following Becca, the second girl in the trio and followed their ex boss Nicholas whose obsession with all things magical has led him into finding a magic mirror which allows the persons insides to be reflected to them. This is a retelling of the Beauty and The Beast story with an extremely good modern twist. I have loved every second of being with Becca and Nicholas. Nick the tortured anti hero who is desperate to prove himself, but due to his selfish tendencies ends up with a curse and Becca, the woman hell bent on protecting her friends and their secrets.I just loved how the story flowed, how they worked well together, the conversations weren't stilted, the action wasn't stagnant, it just all worked so well. When we met Becca in Awake she was fun and witty, here little has changed except she's a little more hesitant to use her magic the way the Alex and Lilia are. Knowing that Nick could hurt them she decides to stay with him and help and man it's just one magic filled moment after another. I finished this pretty quickly because I just loved it. Nick as a character, the faerie realm, the King, the new twist to their magic and of course the love. I wasn't disappointed at all and truly enjoyed reading the book, which I did in like two days. I can't wait until the last book in the series which is due out this year comes out. Make sure to check out Jessica's website and stay tuned for the next book as well.